All aboard! Join giraffe, monkey and elephant on their train journey. The front carriage catches baby’s attention with a light up smokestack. When baby presses the stack, the train comes to life with a song about animals and automatically rolls forward a few feet! One supplied. General information: Size H28, W58.5, D18cm; Weight 2810g; Batteries required: 3 x C (not included). For ages 6 months and over; EAN: 0027084373684. WARNING(S): Not suitable for children under 3 years old. Only for domestic use. 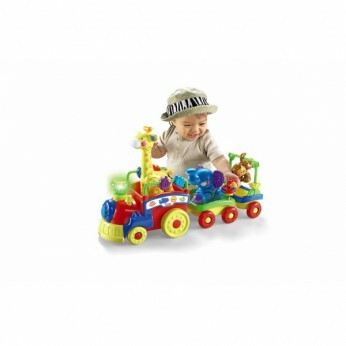 This toy costs approximately £34.99 (for the latest and best prices make sure you check our retailer list for the Fisher Price Sing and Go Choo Choo Train above). In our review of Fisher Price Sing and Go Choo Choo Train we classed it as being suitable for ages 0 to 11 months but recommend you check the manufacturer specific advice before purchasing.